Considering the current geo-political climate, and constant onslaught of negative news and natural disasters, our instinct might be to cling to what we know to solve our current mess. For many people, the thinking is if we could just use our logic and reason to find a solution, we could create order in what seems like global chaos. Maybe this is true, but if you were to ask author and intuitive counselor, Penney Peirce, she would have you take a more radical approach. 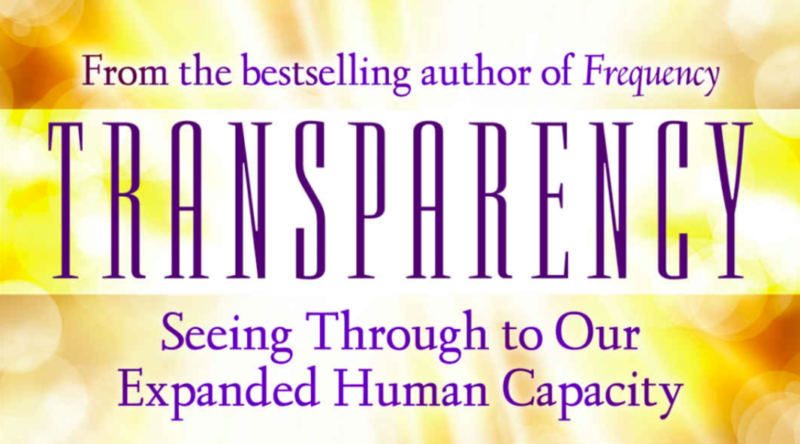 Her fourth book, “Transparency; Seeing Through to Our Expanded Human Capacity,” offers a solution for personal and societal transformation, not by left-brained logic, but through a spherical connection with all things. It is important to note that this is not a book about “transparency” in any traditional understanding of the term. This is a quantum leap into a spherical-holographic look at ourselves, our relationship to the world, and the world’s own evolving vision as it goes through this bridge time between the Information Age and the Intuition Age. What resonated within the chapters of her book was that this approach to transformation didn’t require that we all lose our unique sense of self, or be overly vulnerable. This journey toward transparency will ultimately allow our soul’s authentic presence to shine, revealing our truest self by shedding the insecurities and fears that continue to hold us back. Divided into nine chapters, “Transparency” leads the reader through guided exercises, journal prompts and quick-reference points to shift our perspective to a right-brained perception of intuition, openness and compassion. This transformation ultimately is a way of being in the present moment; living in a Flow state with the universe. What particularly intrigued me about this transformation process was the theory of “spherical-holographical perception.” Penney explains that in order for us to shift from the Information Age to the Intuition Age, we must first understand the difference between two realities: linear perception and spherical holographic perception. Linear perception is based on a model of reality that sees past, present and future progressing sequentially toward an end-point. This reality is primarily a function of the left-brain. However, for transparency to occur, we need to understand a new, spherical mode of reality. This requires a holographic perception, a shift to a right-brain way of seeing the world that creates a field of compassion with our heart at the center-point of this field. A spherical perception means that we have a deeper connection to our reality, and are enabled to pay more attention to a universal truth and ultimately, our soul’s true expression. If there was ever a time to clear the clutter and realize transparency to a soul-based truth, it is certainly now. Penney’s book is a radical and exciting guide to personal and societal transformation that doesn’t shy away from diversity and chaos in our current reality, but rather embraces these circumstances with courage and compassion. After reading “Transparency,” I am very impressed with the depth and detail of her vision—she is clearly a model of transparency herself. We could all be inspired to follow Penney’s inner voice that warmly resonates through her book and take up this critical journey to find our soul’s truth, and ultimately a transparent way of being that connects our global community for the better.